Only a few days ago I mentioned Layar as the ideal platform for rapid development of Augmented Reality applications. I applied for a developer key and was granted one of the limited 50 available keys for the initial launch phase (thanks SPRXmobile!). With this grant comes an understandable NDA, so I can only speak about the program in very general terms. Just let me tell that the platform looks really flexible and developer friendly. I’m excited to be part of this initial community and will update my experiences as soon as I’m allowed to share them! In the mean time, if you have an idea for a (commercial) Augmented Reality application feel free to contact me, we might be able to work something out on the short term. Layar overlays realtime local information on top of the real world seen through a mobile device’s camera. 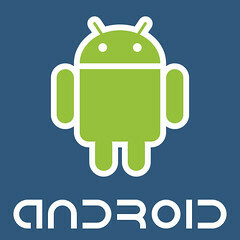 It locates it’s position through a combination of the phone’s built-in compass and GPS. 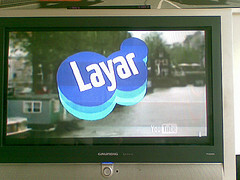 Layar is currently available only for the Netherlands in Android Market. In case you live elsewhere, here’s a demo video. Update: this idea is realized now the 2.0 Layar client is live (Aug 17th, 2009)! …nearby live tweets show up on the horizon, and you can see where they’re coming from, as well as how far away they are. It uses the compass along with the accelerometer GPS to do its location thing, so it’s restricted to the iPhone 3GS in this implementation, even if it is developed almost entirely in WebKit. Judging by this description, there is nothing that prevents this from working on any Android powered device. Even better, there exists this nice new Android app, called Layar, which can load augmented reality layers from a supposedly simple data file (coded in json serialization). They will be opening their API shortly by giving an initial 50 API keys for some lucky developers. I applied for one with this idea, hope to test it out soon! Making photo’s with the Android powered HTC G1 is nothing special, but the recorded GPS postion in the images is a really nice feature when you import them in iPhoto ’09 (note: you need to tell the G1’s camera application to record the GPS location, which is off by default). I had just one minor annoyance with the process: after mounting the Flash card over USB, the card shows up under finder as expected, but iPhoto does not recognize it as a camera device or media card with images. Now Hackszine has a nice blog post with a potential solution: Get your T-Mobile G1 to show up correctly in iPhoto. It all boils down that you have to rename the directory dcim at the root level of the Flash card to DCIM (all capitalized). Every time I plug my G1 phone into my Mac to download photos, iPhoto shows me only the videos that are on the phone, and I have to manually drag the photos from the Finder to iPhoto. It’s only a minor annoyance,but fortunately the fix is very simple. If you navigate to your G1 in the Mac OS X Finder, you’ll see that the DCIM folder (the usual home of photos on a digital camera) is titled “dcim” (lowercase). I made it uppercase, unmounted and remounted it, and iPhoto popped up with a list of the photos on the phone, ready to import. To my frustration this was not working for me. Just one more step solved the issue: inside the directory dcim is a sub-directory called camera. Just symlink this directory to some well-known camera manufactor’s default images directory name, and you’re set. Next, take some pictures with the phone. Then start iPhoto and mount the phone’s Flash card; you will get the “import pictures” screen as you would expect. Note: based on Dutch release version of T-Mobile G1 (first edition) and iLife ’09, YMMV! Does this matter in your experience? (I wasn’t aware that you could format the card in ext3 format, might be interesting though).